Just because the weather turns colder doesn’t mean that you’ll stay off the roads unless there’s ice or snow. Even then, you can prepare your car to drive in these conditions if you have the proper tires or chains on your tires. Road Runner Auto Care in Apple Valley can check your tires before you get on the road in the winter to ensure that they are safe and have the proper air pressure. 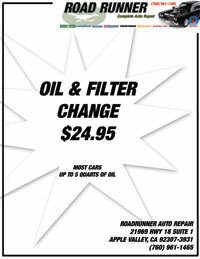 Road Runner Auto Care in Apple Valley can change the filters in your car so that they easily allow air through and can also change your oil so that there is a lighter weight in the vehicle during the winter months. A deicer can be added to your windshield wiper reservoir. This liquid will make it easier to melt the ice on the glass instead of scraping the windshield as much. A deicer product can also be added to your gas tank to keep the fuel lines from freezing. Keep your car as full as possible to prevent any kind of moisture from building up in the gas tank and in the gas lines. The moisture could freeze if it gets cold enough or stays cold for long periods of time. Your cooling and heating system also need to be examined. Road Runner Auto Care can add anti-freeze to your car if you’re in the Apple Valley area. This will help prevent the radiator and lines from freezing in the cold weather. 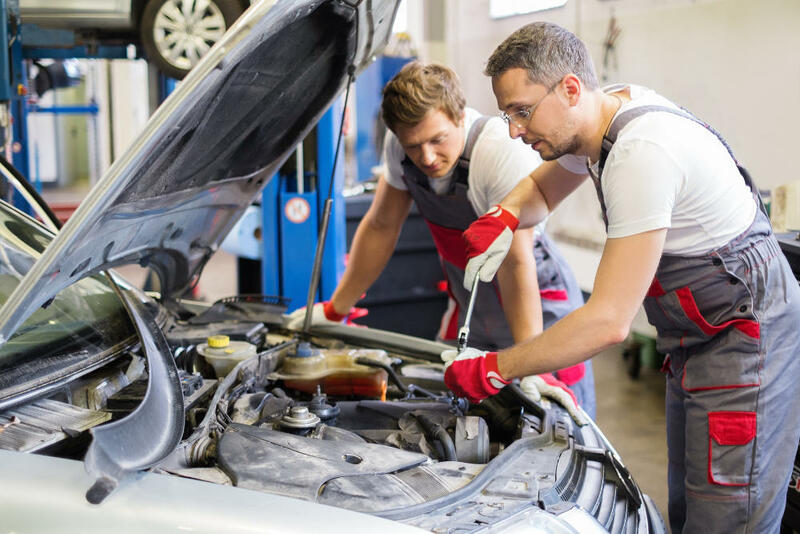 The best way to ensure that there isn’t water in the lines is to have the mechanic drain the liquid currently in the radiator and reservoir before adding anti-freeze. Check the heater to see that it’s working properly. If it’s not heating, then the heater core could be bad, or there could be an issue with the thermostat and cooling system.